Republican presidential candidate John McCain reminded people Thursday that some Japanese were tried and hanged for torturing American prisoners during World War II with techniques that included waterboarding. "There should be little doubt from American history that we consider that as torture otherwise we wouldn't have tried and convicted Japanese for doing that same thing to Americans," McCain said during a news conference. He said he forgot to mention that piece of history during Wednesday night's Republican debate, during which he criticized former Massachusetts Gov. Mitt Romney after Romney declined to publicly say what interrogation techniques he would rule out. "I would also hope that he would not want to be associated with a technique which was invented in the Spanish Inquisition, was used by Pol Pot in one of the great eras of genocide in history and is being used on Burmese monks as we speak," the Arizona senator said. "America is a better nation than that." Waterboarding generally makes breathing difficult and can cause the subject to think he's drowning. It's banned by domestic law and international treaties, but those policies don't cover CIA personnel and President Bush's administration won't say whether it has been allowed against terrorism detainees. 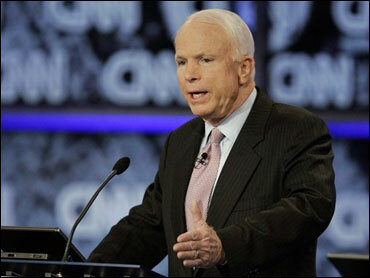 McCain was a prisoner of war for more than five years during the Vietnam War. He was tortured during that time, but said he wasn't subjected to waterboarding. "If the United States was in another conflict, which could easily happen, with another country, and we have allowed that kind of torture to be inflicted on people we hold captive, then there's nothing to prevent that enemy from also torturing American prisoners," McCain said. McCain also said the presidential primary process needs to be straightened out, and if the political parties can't, Congress should. "The people deserve a longer process of scrutiny of the candidates and they're not getting it. It is a little bizarre for us to be having a primary on Jan. 3," said McCain, referring to the Iowa caucus. Florida moved up its primary election to Jan. 29, and Michigan later set a Jan. 15 date, moves that set off a scramble that resulted in Iowa's caucus and the New Hampshire's primary moving up to preserve their early voting status. New Hampshire will vote Jan. 8. New Hampshire, Iowa and South Carolina should still be allowed to pick their candidates ahead of the rest of the country, but the country should then be divided into four sections with voting in each on a schedule that allows candidates time to campaign in each region before moving to the next, McCain said.